Kids will appreciate attractions like Muro Alto Beach and Pontal de Maracaipe. 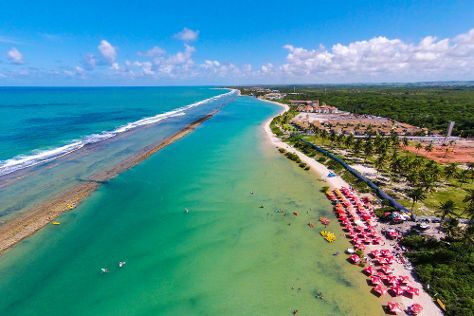 Explore Porto de Galinhas' surroundings by going to Maragogi (Maragogi Beach & Zoologico Pet Silvestre), Carneiros Beach (in Tamandare) and Lookout Stone of Cogomelo (in Cabo de Santo Agostinho). There's much more to do: enjoy the sand and surf at Vila de Porto de Galinhas Beach, race across the water with a speed boat tour, see the interesting displays at Museu das Tartarugas - Ecoassociados, and stroll through Praia De Maracaipe. To see traveler tips, reviews, and tourist information, go to the Porto de Galinhas trip maker app . In June in Porto de Galinhas, expect temperatures between 32°C during the day and 26°C at night. Finish your sightseeing early on the 19th (Wed) to allow enough time to travel back home.